Our margarine powder is a versatile powder that can be used as a spread for your pancakes, french toast, waffles, breads, and muffins. Margarine powder can be used to make your baked goods, such as cookies and other baked goods. The only drawback with margarine powder is that you cannot fry foods like you can with regular margarine. This powder is great to have on hand for you and your family. A need for your long term food storage-not just a luxury! Ingredients: Partially hydrogenated soybean oil, whey, nonfat-milk, mono & diglycerides, sodium caseinate, salt, color, natural flavor. Margarine powder is an easy substitute for butter that works as a spread on breads and pancakes. It works well in all baked goods and on cooked vegetables, pasta, rice, potato dishes, and other dishes. Its only limitation is that you cannot fry with it the way you can with regular margarine. Margarine powder is the perfect solution for your camping needs. Does not need refrigeration. A delicious addition to your food storage staples. Directions: Dehydrated margarine powder is 70% fat whereas margarine is 100% fat. Adjustments may need to be made for recipes and mixes requiring fat. For every 16 oz. fat needed you will need to add 21 oz. powder. Adding a small amount of oil to powder may be sufficient to get desired results. This powder works well when added to rolls, breads, cookies, and cakes. For making mixes, add dry product using equal portions. 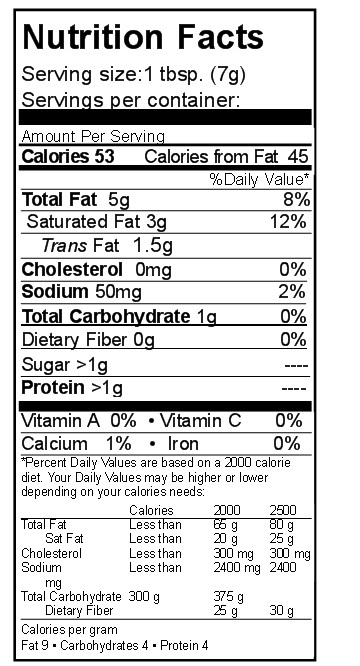 Example: ½ cup margarine is equal to ½ cup margarine powder. Add 1/3 cup increased liquid (water or other). You may need to adjust amount of water added for desired consistency. For enhanced texture and flavor, add 1 tsp. of vegetable oil. When used in baking keep batter moist as it will dry during baking process.